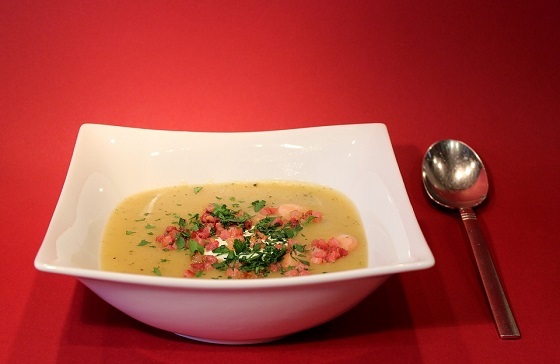 Potato soup is one of those easy meals you can make any night. This recipe is no different but there are a few more steps than just boiling potatoes. It uses a porcini oil to help give it that extra umami flavor, a literal combination of dried porcini mushrooms simmered in oil to impart that flavor and give you that taste at the end. They also use Taleggio cheese which isn’t quite cheddared but still gives a wonderful creamy taste to the finished product. Between the Brie and the cheddar, Taleggio, the mild, super-melty cheese from Italy, gets forgotten — but it’s one of our favorite cheeses for this soup. But here’s the thing about this soup: You can really use any melting cheese you like. If Taleggio is not available, try using a soft Brie or a white cheddar. You can really use any cheese you have on hand or love. © 2019 Wilmington Catering Authority.